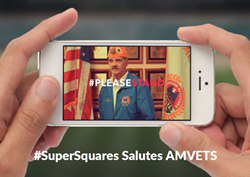 Shut out of the Big Game, AMVETS can, through Super Squares™, send its message of patriotism and civic engagement beyond the TV screen, to reach its audience directly. In response, AMVETS produced an expanded video version of the campaign that features AMVETS commander Marion Polk, and then turned to Tampa Bay-based Super Squares™ as a digital advertising partner to “air” the ad. To download the app and learn more, visit http://SuperSquares.com, or directly from the Google Play Store at https://Q.cr/droid_1, and the App Store at http://www.Q.cr/SS_iOS_1. Founded by technology innovator Frank Maggio, React LLC is an interactive advertising company geared around the concept that advertising should be engaging and “reactive,” where consumers benefit by engaging with advertising in a way that benefits them, and the brands hoping to reach them. With patented technology, React honors user privacy by never selling or sharing personally identifiable information. React is presently launching Super Squares™, with reactive reality TV game shows ReacTV® and Instant Millionaire™ on the 2019 product map.